Weekly Happenings: We had a pretty quiet week this past week. The weather has been sort of…oppressive. Due to that, we spent most of our time indoors. There was one day where Joseph had a friend over to play, but other than that (and getting to meet up with a friend from high school who was in town for work), it was a pretty average week. Today is Father’s Day, so I made Paul breakfast, and Joseph gave him a card he made, along with a Google Play gift card. The Weekly Weather: Rather hot and humid. We finally hit triple digits. I’m surprised we made it this far into the warm months before doing so, though. There is rain in the forecast for this next week, but it will only cool down a bit. I guess we’re in for the long haul until October/November now, haha. What Paul’s Been Up To: Typical stuff for him this past week: work, school, yard work, etc. For a while now, he’s been saying that he wants to find a good deli to have a legit deli sandwich. Well, he was able to find one and we went yesterday for lunch. They were really good! We’ll definitely be going back. 🙂 On the way home from lunch, we stopped so that he could go get his main Father’s Day present. He purchased an AR-15 to add to his gun collection. He’s looking forward to when it will be cool enough for him to go target shooting with it. What Sarah’s Been Up To: I’m just pluggin’ away with the mommy-life. I’m so grateful for Paul’s good job and for the fact that the cost of living here in Texas is low enough. It makes it possible for me to be able to stay home with the kids. This is something I don’t know we would have been able to accomplish in California. One thing I did that made me sort of nervous, but wasn’t as bad as I thought it would be, was that I cut Joseph’s hair. We’ve been taking him to a kids’ salon up to this point because he has sort of freaked out whenever we’ve tried to cut it. The combination of the noise and vibration of the trimmer was just too much (the more expensive ones the salon has are much quieter, plus the distraction aspects of getting to sit in a cool car chair and watch videos while they cut his hair made it tolerable). 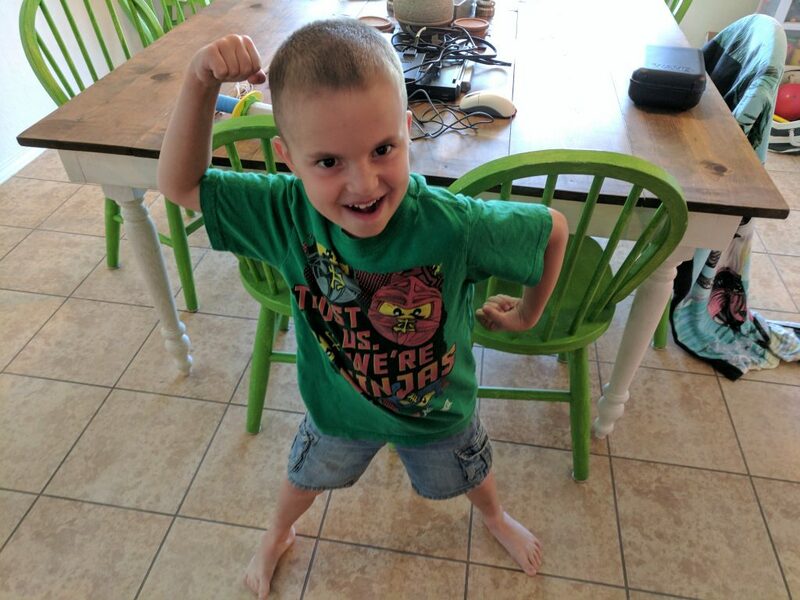 A while back, Paul purchased a quieter trimmer, but the vibration still bugged Joseph, so we were still going to the kids’ salon. Well, I went to take him to get his hair cut only to find that they were too busy to squeeze him in. That meant that with our schedule the way it is, I wouldn’t have been able to take him back until mid-week this next week. I didn’t want to wait that long, so I decided to swallow my apprehension and do it myself. I had watched them do it enough times that I had the concept down. It was just putting it to use and praying I wouldn’t butcher it, haha. It wasn’t too bad! It definitely didn’t turn out as well as if the salon had done it, but he doesn’t need a hat to cover his head, either. 😉 He did really well, too. I promised that he could run in the sprinklers afterwards, so that incentive helped a lot. What Joseph’s Been Up To: He did enough pages in his workbooks to earn a “big prize”. We got him some Minecraft magnets. We also purchased a small cookie sheet so that he has a building surface to make stuff with. He was pretty excited. 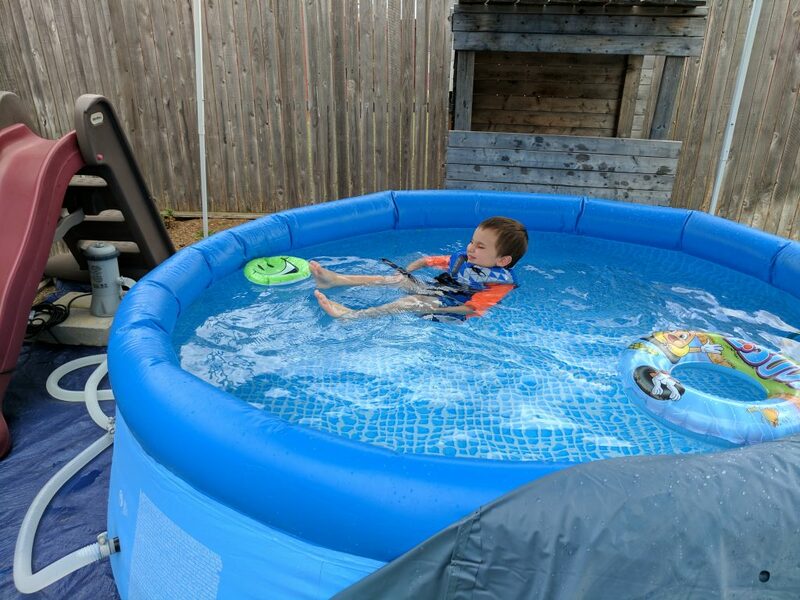 🙂 Other than that, he’s been pluggin’ away with fun summer stuff: playing with toys, some electronics time, swimming and sprinkler playing, etc. 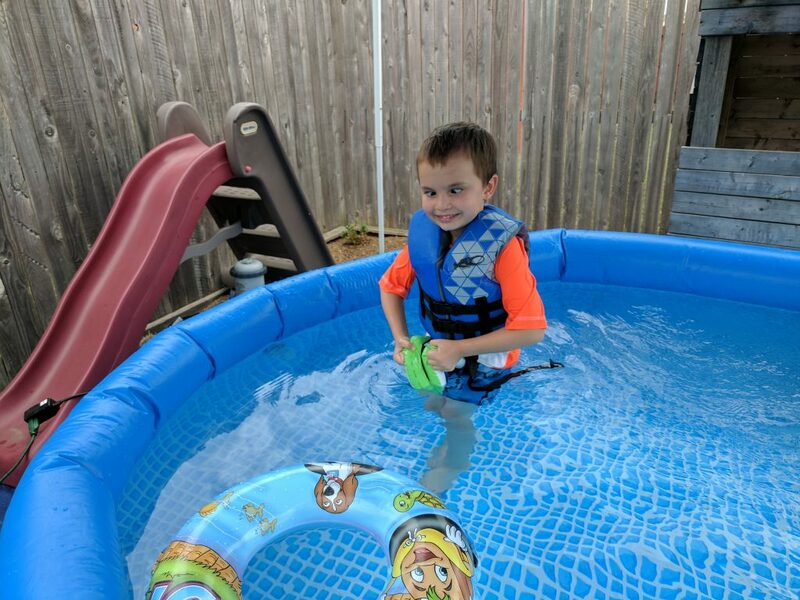 Even though the water only comes up to his waist, he likes the sensation of floating, so he sometimes asks to have his life-vest on. He was showing me his “back swimming” in this picture. He’s really into taking goofy pictures right now. He’s also just learned how to cross his eyes. This is the result, haha. 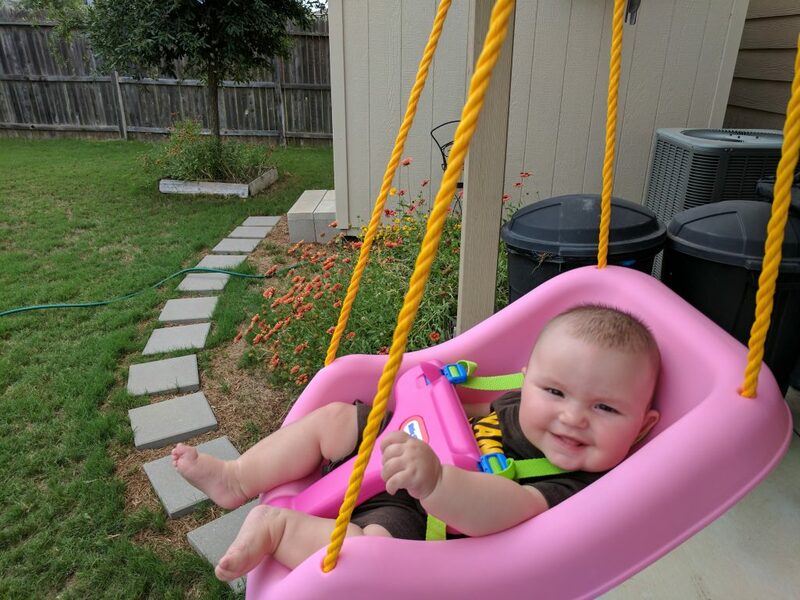 Hanging out in the swing while big brother plays in the pool. Post-haircut. 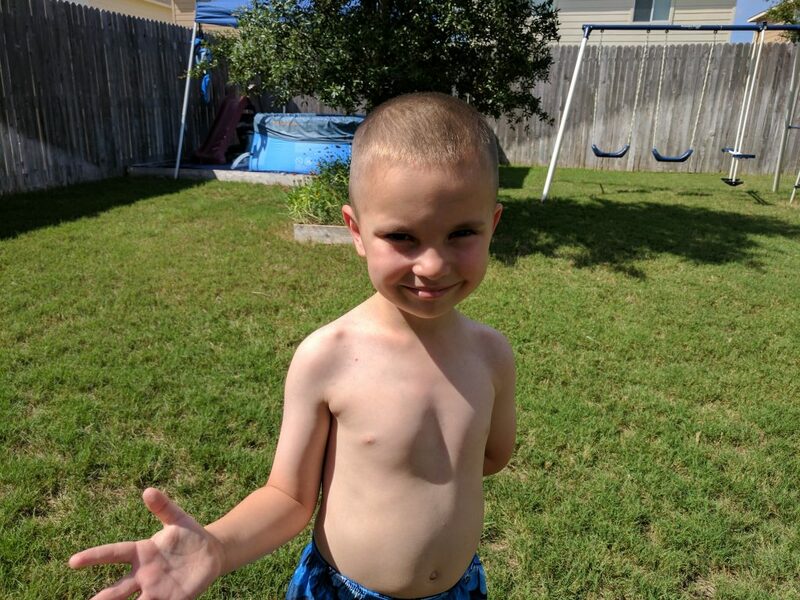 I cut it on the back patio and already had him in his swim trunks so he could go straight to sprinkler playing as soon as I was done. I basically did what they do at the salon: a “high-and-tight”. I buzzed it all over with a three, then made the sides a bit shorter (using a one), and figured out how to use the tapered attachments to fade the two lengths together. I then cleaned up his neck and around his ears (there’s a special attachment for the ears that makes it so nipping them with the clippers is pretty much impossible).